Peabo is the debut album by soul vocalist Peabo Bryson. Luther Vandross was the backing vocalist. 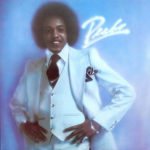 Released in 1976 on Bullet Records, this was Bryson’s only album with the label before moving on to Capitol Records. Capitol subsequently took control of the rights to this album and the rest of his Bullet recordings released and unreleased. Record Company – Bullet Records, Inc.
Record Company – Web IV Music, Inc. Published By – Web IV Music, Inc.